Become a Perennial Donor today! By committing to give to Growing Gardens monthly, you support garden programs all over the state of Oregon. 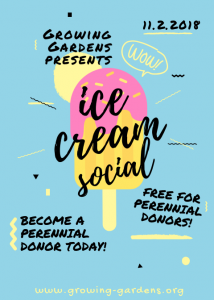 When you sign up to become a Perennial Donor during the month of October you will be invited to join us for an Ice Cream Social with Jared Goodman of Morgan Street Theater! Click here to become a Perennial Donor!